Ah, Clynelish. A very distinguished distillery with a great history and character. I'm too lazy to recount it here so head to maltmadness.com or whiskyfun.com to learn more. We've got a Clynelish comparison today with the OB 14yo and a 1995 single cask from Duncan Taylor's Dimensions range. The first time I tried the 14yo I was pretty underwhelmed. It was a lot lighter than I thought it would be, despite the 46%. And I have to say kudos to Diageo for keeping it at 46! Anyway, this try I got a lot more from it. Nose: Aromatic Highlander. Lovely fresh fruit and wax combo. Grilled pineapple coated with cinnamon (Brazilian style), mango, white grape, citrus- Lemon, camphor, candle wax, sealing wax, a little floral, a little salt. Water: More full and fruity. Floral note coming out- Old pressed flowers. Taste: Soft arrival, building acidic fruit with a lovely oiliness, mango, lemon, wax, oily fruit. Zesty development with more lemon, lemon fizz, sour , a little pineapple, some cinnamon, fresh spicy ginger, prickling oakiness, more oily into the finish. Water: Fuller as well. Bigger arrival, recedes then a bigger development with lots of orange oil, some chocolate into the finish. Comes together a bit. Finish: Medium length. Lemon oil, salt with some sour prickling oak. Darker with chocolate with water. Reminds me of some of the other North Highlands malts like Balblair and Old Pulteney. This next one was distilled June 1995, bottled October 2014. Matured in a Sherry hogshead (4676). Sherry Hogheads can be amazing. Nose: Lovely waxy fruitiness (exactly what you would expect from a Clynelish). Green and white grape, white wine, there's some berries and Sherry hiding behind the alcohol. Opening up and getting fruitier and sweeter- Honey, raisin, toffee, vanilla, syrup, dates, grapefruit, dark chocolate and brown sugar. Oaky spice coming out after a bit. Water: More oily, getting even better now with spices, coffee and chocolate, all working well. The grapefruit is standing out more too with orange. Takes water very well with lemon, orange and a little charcoal and soot. Great nose overall. Taste: Grapefruit nip. Creamy, smooth, quite relaxed and easy going. Quite sweet with white wine, white grape, a little salt, light brown sugar, toffee, still quite waxy with a lovely chimney soot note developing and then dark chocolate that brings a nice bitterness into the finish. Quite mouth watering. Water: Softer but more a oily and sooty development. Working better with more Sherry, plenty of good quality chocolate and coffee. The grapefruit is standing out again with citrus- Orange peel and lime tang. Quite acidic and oaky into the finish. Finish: Medium length. A very nice combination of tannins, sweet honey and caramelised brown sugar. More good quality coffee with water. Very nice stuff. Might have bought a bottle for £80. 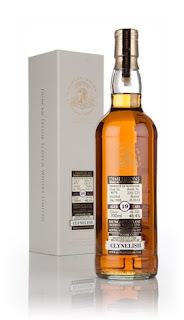 Overall, Clynelish has got a lot of character and I'll be keeping an eye out for indies at a good price.